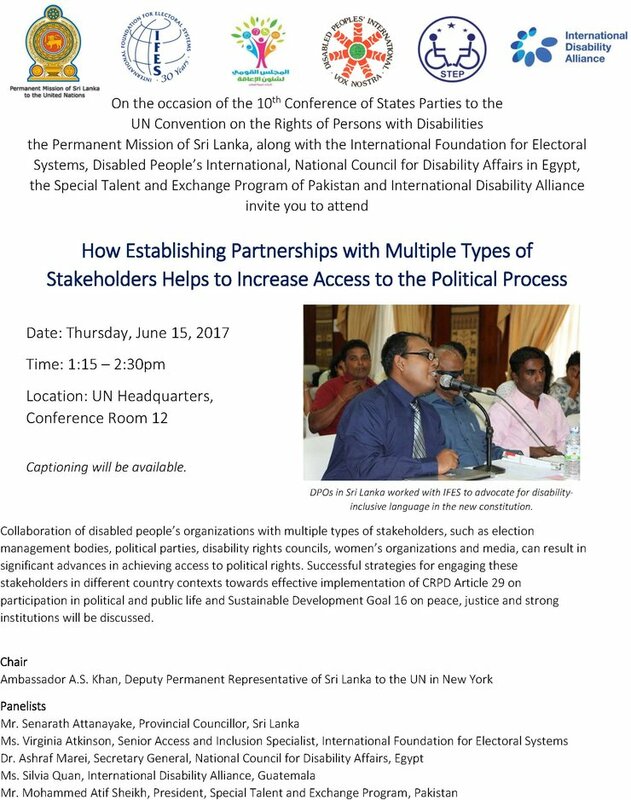 On June 15, the Sri Lankan Mission to the United Nations and the International Foundation for Electoral Systems (IFES) will co-host a side event at the Conference of States Parties for the Convention on the Rights of Persons with Disabilities (CRPD). Collaboration of disabled people’s organizations with multiple types of stakeholders, such as election management bodies, political parties, disability rights councils, women’s organizations and media, can result in significant advances in achieving access to political rights. Successful strategies for engaging these stakeholders in different country contexts towards effective implementation of CRPD Article 29 on participation in political and public life and Sustainable Development Goal 16 on peace, justice and strong institutions will be discussed. For more information, please see the flyer above or the plain text below.